I can tell you that I try to make a habit of hiding my phone from myself for various intervals throughout the day. I can tell you how I organize and 'bucket' my to-do lists so that all small errands within a limited radius around my home get finished in one shot and seem less overwhelming (saving time makes me VERY happy). I can tell you how my husband and I often like to hit the archives of our computer and scroll though pictures and videos from when our girls were babies... just so we can giggle at their chunky cheeks and wonder where those babies went. I can also tell you how spending a bit of solo time with each of my daughters - without the other one around - tends to make each of them and myself more fulfilled and giddy in the most inexplicable way. 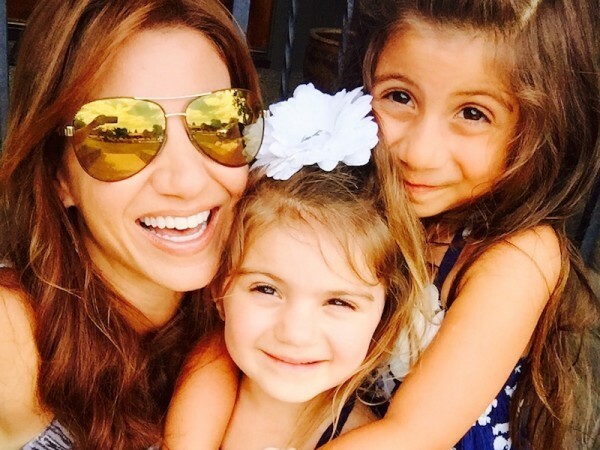 All of us moms find our ridiculous tricks for happiness one way or another (more wine? sure! ), and all those tricks grant me joy, give me a giggle and make me happy. But, as we're learning more and more (through things we read online and watch on TV) real and lasting happiness is directly tied to gratitude. To think of all those times our moms made us say thank you as kids... they were on to something bigger than big. Not too long ago, I read a most raw and vulnerable post written by a mom I'm connected with through a Facebook group. We don't know each other and have never met in person (I can't even remember her name right now). It was one of those posts that just keeps popping up in your newsfeed for whatever reason, insisting that you read it before scrolling on to something shallow and frivolous. It was a fairly long post, but well warranted and extremely well written: This mom was asking for prayers for her son. We've all seen posts like this on Facebook. Some of us have written posts like this on Facebook. But for some reason, the way this mom shared the details of her feelings, coupled with the timing of when I read her words, slayed me. She continued her post with a call to action... to paraphrase: Do not complain if your child wakes up in the middle of the night, use that time to cuddle. Do not complain about homework duties or common core, be thankful your child can attend school. Do not complain about those parents who kiss their kids on the lips, go kiss your kids now. Gratitude. I felt gratitude. Gratitude for my feisty 3 year old who still hasn't allowed me to sleep a full night's sleep since I-can't-remember-when. Gratitude for my daily challenges involving the car pool line. Gratitude for my slowed-down waning career (that I often struggle coming to terms with). Gratitude that my mom (who's been battling cancer for about five years now) is still thriving and here with a smile on her face. Gratitude that I saw that Facebook mom's message right then and there. Check our stupid stuff at the door. Now. It's time to get happy. Be grateful. Be happy. Search for and find the joy in the moment you're in, even if that joy is so tiny and nearly-impossible to see at first glance. Say thank you to someone. Say thank you for something. Thank you, Mom Who Wrote That Facebook Post. You have shaped my perspective in a way that will stay with me and affect my happiness factor forever. I am grateful for your honest post. I wish you hope, love and and am thankful for your words that found me at a most uncertain moment in my life. Gratitude leads to happiness. As moms, we have the power to choose it every single day. How fabulous.